You also knew that he'd be supported by many of the greatest radio performers ever to haunt "Radio Row": Virginia Gregg, Howard McNear, Lurene Tuttle, Joseph Kearns, John Dehner, Stacy Harris�even Vincent Price! 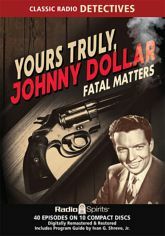 Bob Bailey stars as Johnny for five fascinating five-part serial adventures, and a collection of harrowing half-hour tales! Prepare the expense report!